I have finished up my Christmas decorating. Living in a small space has meant scaling back on what I used to have, but I am happy with what I have done. I have changed things up from last year, when I had a more playful feel. One side of the dining room is taken up with a drop leaf table and two mismatched chairs. 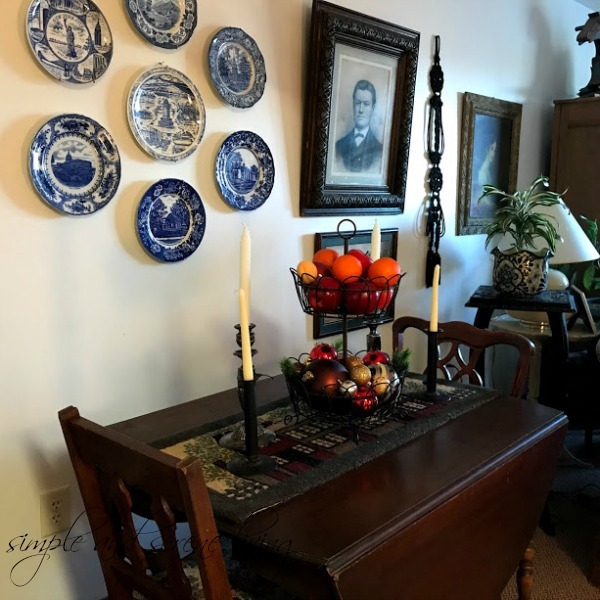 Although I seldom eat at the table, it is the first thing I see when I walk in the door and so it is nice to have it looking a bit festive for the holidays. 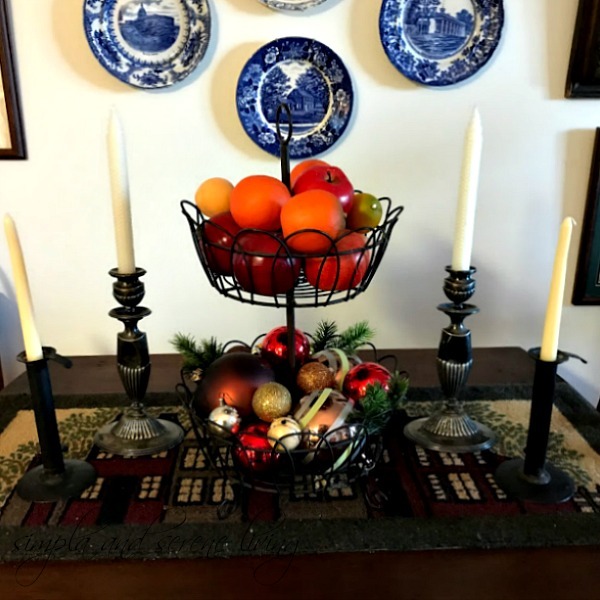 I removed the fall things from my two tiered basket on the table and filled it with Christmas items. Fruit went in the top basket while a shiny assortment of Christmas balls filled the bottom. I also chose to mix hog scraper candle holders with a pair of antique tarnished silver candlesticks. 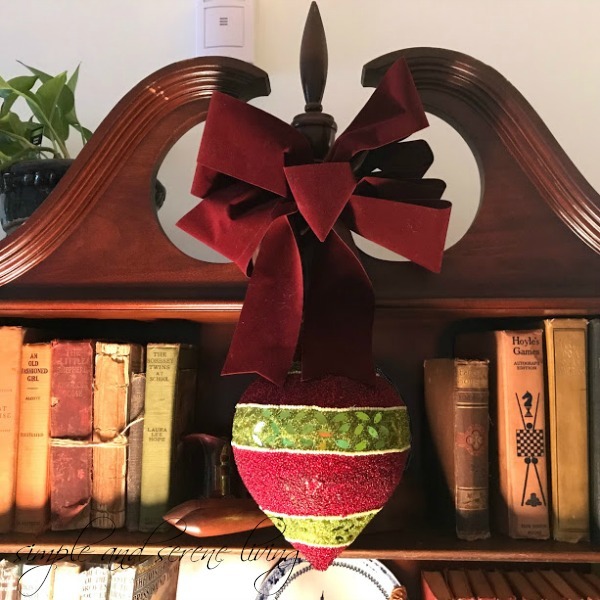 A pretty ornament tied with a velvet bow adorns the antique fall front desk that sits on the opposite wall. My special nativity sits on one of the shelves, but as I forgot to photograph it I'll share it another day. As you know, my mom had a mild heart attack in November and has not been feeling well at all. She is having constant nausea, difficulty swallowing, and has some internal bleeding. As they aren't sure of its source, she is scheduled for a colonoscopy and an endoscopy today. Because of her age they don't want to put her under anesthesia more than once. I hope you will add her to your prayers. Hopefully they will be able to determine what the problem is and give her some relief. Have a wonderful day. I'll update in a couple of days to let you know how it went. Prayers for your mom Laura. I hope they can find the cause of her symptoms. I am embracing a simple decor this holiday too. When you live small less is more is good. I love what you have done. I'll pray for her to Laura. I love your pretty home and know you are happy to have it to decorate in your beautiful style. I only brought out a few things this year. I can't stand too much at one time. Hugs! Your home is lovely. I'm doing much less decorating this year also. Prayers for your Mom. My Mom got a cold on the trip to TX and is still not feeling well. It's a hard time of year to have our loved one's sick. Hugs to you. Your home is very pretty, Laura, and I will keep your mom in my prayers. Prayers for your mom...and for you. Prayers for your Mom, Laura. I'm sorry to hear about your mom, Laura. That's scary. I pray that God will give the doctors insight and the ability to help her, and that your mom will have peace through it all.